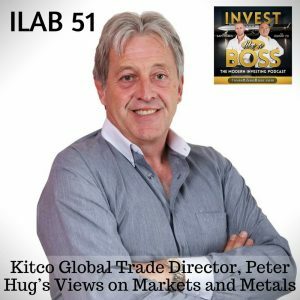 Peter Hug is the Director of Global Trade at Kitco Metals Inc, which has retail and online departments for trading metals as well as a news division called Kitco News. Peter is one of a handful of experts who have succeeded through multiple bull and bear cycles using skills honed during the dramatic fluctuations of the 1980s. Prior to joining Kitco, Peter served as Senior Vice President at Guardian Trust Company, now a part of Laurentian Bank, which became one of the largest international trading houses for precious metals. With equity markets surging, we wanted to hear from Peter on his views of precious metals, where they belong in your investment portfolio and how fed and geo-political variables can affect prices. Peter also shares with us daily operations at Kitco and some interesting insights to the purchasing of physical metals. Listen to ILAB 51 on iTunes here or subscribe on your favorite podcast app. 12:48 – Should you buy gold?